World Rhythms 15: We Have the Beats! Issue 15, Winter 2017-2018: We Have the Beats! When musicians are exposed to the musical knowledge developed by traditions that are not native to their upbringing, new traditions are created. This process is normally an organic one. The more musical knowledge you have, the more that knowledge comes through in the music you create. But it can be fun to make exercises bringing ideas from different traditions together. 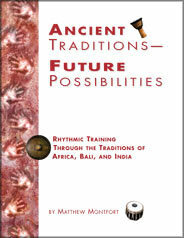 The book Ancient Traditions – Future Possibilities: Rhythmic Training Through the Traditions of Africa, Bali and India includes an entire chapter on world fusion exercises. But rather than including a large set of exercises, just a few key examples are presented to inspire you to create your own. We begin with a world fusion exercise, and then delve into the traditions it is based on. This exercise combines Balinese and North Indian rhythmic concepts. This intermediate level example from Chapter 4, Exercise I, page 127 of Ancient Traditions – Future Possibilities is in a 15 beat rhythmic cycle. 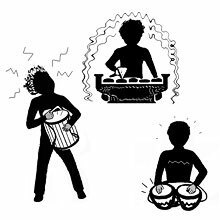 Recite the drum syllables of the tihai (North Indian rhythmic phrase that repeats three times and lands on the first beat of the rhythm cycle), starting first with the bottom part of the kotèkan (Balinese interlocking rhythm), and then proceeding to the top and more offbeat part. For an explanation of the notation below, see the North Indian Tala page. Also see the Pronunciation Guide to Indian Drum Syllables. Key: Each syllable is a quarter of a beat, or 16th note. An * signifies a rest. Here we will explain the two traditions behind the above fusion exercise. A tihai is a common North Indian cadential pattern repeated three times in succession. The last note of the cadence is timed to fall either on the sam, the first beat of the tala (rhythmic cycle), or on the the beginning note of a main musical phrase. One repetition of the pattern is known as a pala. Musicians become skilled at fashioning tihais on the spur of the moment to create a cadence, and must continually be aware of where they are in the rhythmic cycle and consequently how many counts are left in which to play a tihai. In North Indian music, the term laya refers to both the main tempo of the beats in the tala and the relative speed of the notes played during each beat of the tala. Another way to look at the later meaning is that the number of divisions per beat is referred to as the laya. Instead of looking at four notes per beat in 4/4 time as sixteenth notes, the speed of the notes relative to the beats is considered a laya of four, or chaugun laya. Of course, the laya used is an important part of calculating the tihai math. Does math make your brain hurt? Then skip to next part. But you will become a better musician if you embrace math. G = [(CTL +1) - 3P] ÷ 2, where C = the number of repetitions of the rhythmic cycle required to bring the tihai to sam, T = the number of beats in the tala (rhythmic cycle), L = the number of laya divisions, P = the length of one pala of the tihai expressed in laya divisions, and G = the gap or breath between pala repetitions expressed in laya divisions. The tihai takes only 1 cycle of 15 beats with a laya division of 4 notes per beat, so CTL = 1 x 15 x 4, or 60. Therefore, CTL + 1 = 61. One pala of the tihai takes up 17 laya divisions of 4 notes per beat, so 3P = 3 x 17, or 51. Therefore [(CTL +1) - 3P] = 61 - 51, or 10. 10 ÷ 2 = 5, so the gap is equal to 5 laya divisions of 4 notes per beat, or 5 16th note rests. Try making your own tihai using the G = [(CTL +1) - 3P] ÷ 2 formula! A gamelan is an ensemble normally composed primarily of percussion. In Bali, orchestras of tuned gongs, bronze kettles, bronze metallophones, bamboo xylophones, drums, cymbals and flutes fill the night air with animated music. Melodic parts interlock, divided in such a way that musicians play alternate notes to form the melody line. These interlocking parts, known as kotèkan, require cooperation and a keen sense of rhythm to perform. The two parts of a kotèkan, which are thought of as male and female, are known as nyangsih and polos. The main accents of the nyangsih part are usually on the offbeat, while the main accents of the polos part are usually on the beat. Knowledge of kotèkan can be extremely valuable. These interlocking rhythms have a unique way of bringing people together in cooperation towards a common goal, and there are many creative possibilities for applying them to contemporary music. Here is an example of a traditional kotèkan. The bottom part is the polos, and the top part is the nyangsih. Ancient Traditions – Future Possibilities includes a set of cards representing all 26 mathematically possible one beat kotèkan patterns without rests. They are very useful for creating your own kotèkan patterns for pre-existing or yet to be written melodies. "Nyo Nyo Gde" by Matthew Montfort from World Without Walls by Ancient Future: Play on Ethnocloud. Play on Spotify. Play on iTunes. ﻿A. West Africa, Bali, and India, birthplaces of polyrhythm, gamelan, and tala. If you answered "all of the above," you are well on your way to finding the beat! Read on to find out how a training manual on the rhythms of Africa, Bali and India can help performers of all types reach their musical dreams, enable listeners to get more out of music, and is now bringing these ancient rhythms into the grooves of the future with the release of an audio companion edition for digital audio workstations, sequencers, computers, tablets, smartphones, CD players and other gizmos! This classic "world beat bible" by Matthew Montfort takes the student on a musical voyage through the ancient rhythmic traditions of Africa, Bali, and India with a series of exercises that require no instruments to perform. Interesting, imaginative and fun, these rhythm exercises will be of immense help to all music lovers, not just percussionists. Indeed, Matthew Montfort, leader of the trailblazing world fusion music group Ancient Future, was inspired to write the book because it was difficult for him to find musicians who had the skills to perform multi-cultural music. By enabling home study of non-Western rhythms with enough material for years of practice for most students, the training develops refined rhythmic skills, promotes multi-cultural musicianship, stimulates new ideas for composers and improvisers, and fosters cross-cultural music appreciation. ﻿Ancient Traditions – Future Possibilities: Audio Guide and MIDI Groove Tracks from the Traditions of Africa, Bali, and India. By Matthew Montfort. Ancient Future Music (AF-0001, 2005. V 4.0, 2017). New Preview Release! Companion MP3/MIDI Guide Tracks Download Set- $34.95 (SALE 24.95): Add 1 to Cart. Buy 1 Now. Companion Audio/MIDI Guide Tracks 2 Volume CD/CD-ROM Set- $39.95 (SALE $29.95): Add 1 to Cart. Buy 1 Now. Ancient Traditions – Future Possibilities: MP3 Audio Guide Tracks. By Matthew Montfort. Ancient Future Music (2005). New Preview Release! Companion MP3 Audio Guide Tracks Download- $24.95 (SALE 17.95): Add 1 to Cart. Buy 1 Now. 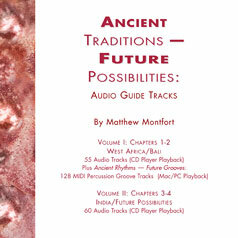 Ancient Traditions – Future Possibilities: Audio Guide Tracks is a set of 115 audio guide tracks of the exercises in Ancient Traditions – Future Possibilities that help facilitate correct practice habits. The download version is divided into three zipped folders of MP3 files. Volume I covers the exercises in Chapter 1, West Africa, and Chapter 2, Bali. Volume II A covers the South Indian exercises in Chapter 3, India. Volume II B covers the North Indian exercises in Chapter 3, India, and Chapter 4, Future Possibilities. Two printable .pdf booklets are included: the A.T.F.P Audio Guide Tracks CD Booklet, a wrap around CD booklet with instructions for burning CDs if desired, and the A.T.F.P Audio Guide Track List, which includes the names, durations, tempo settings, and book page numbers for all 115 audio guide tracks. Ancient Rhythms – Future Grooves: MIDI Percussion Groove Tracks from the Traditions of Africa, Bali, and India. Version 4.0. By Matthew Montfort. Ancient Future Music (1997. V. 4.0 2017). New Preview Release! MIDI File Download- $24.95 (SALE 17.95): Add 1 to Cart. Buy 1 Now. Ancient Rhythms – Future Grooves: MIDI Percussion Groove Tracks from the Traditions of Africa, Bali, and India is a complete set of 128 MIDI tracks that playback in Standard MIDI File compatible web browsers. For greater control or for use as rhythm tracks in audio productions, load them into a MIDI sequencer app (Mac, PC, iOS, Android, etc.) to loop tracks, change the tempo, or listen to individual parts. The files come arranged for General MIDI percussion and can be remapped to other instruments using the included MIDI maps with explanations of the sounds of West African drums, Balinese gamelan, South Indian mridangam, and North Indian tabla. A full set of tabla samples is included along with supporting files for using them with VSTi instruments (PC) and GarageBand (Mac). The Eve people of the island town of Anyako off the coast of Southeastern Ghana have developed a music rich in polyrhythmic interplay, such as in the drum music of takada, a dance and drumming club developed by the Eve women. The instruments of their percussion orchestra are detailed in the West African section of Ancient Rhythms – Future Grooves. The exercises are arranged for General MIDI agogo, bongo, conga and maracas. MIDI maps of the Eve instruments are included for those who want to experiment with different drum sounds. A gamelan is an ensemble normally composed primarily of percussion. In Bali, orchestras of tuned gongs, bronze kettles, bronze metallophones, bamboo xylophones, drums, cymbals, and flutes fill the night air with animated music. Melodic parts interlock, divided in such a way that musicians play alternate notes to form the melody line. These interlocking parts, known as kotèkan, require cooperation and a keen sense of rhythm to perform. The Balinese section of Ancient Rhythms – Future Grooves details the music and instruments of the Gamelan Semar Pegulingan and other ensembles. The perception of the cyclic nature of life is reflected in Indian classical music through the device of tala, a recurring time-measure or rhythmic cycle. There are two different traditions in Indian classical music, the Carnatic music of South India and the Hindustani music of North India. The tabla is a North Indian drum set comprised of two drums with goat-skin heads. For every sound on the drum there is a corresponding syllable. These syllables are known as bols. Each North Indian tala has a theka, a standard set of bols that identify the rhythmic cycle. The MIDI files of these thekas are arranged for General MIDI conga and bongo, and make excellent groove tracks for creating compositions or practicing. The North Indian section of Ancient Rhythms – Future Grooves features a full explanation of the tabla bols complete with audio links to tabla samples of each bol, and files for VSTi instruments and GarageBand that remap the MIDI files to the included tabla samples. The mridangam is a South Indian two-headed barrel drum made of jackwood with goatskin heads. South Indian drumming has a language all of its own known as solkattu. For the sounds produced by the mridangam, there are corresponding syllables known as konokol. The South Indian section of Ancient Rhythms – Future Grooves features an explanation of the konokol syllables used in the solkattu compositions that are presented. The South Indian rhythm exercises have been arranged for General MIDI conga and bongo. Instructions and sequencer files are included to help in remapping the MIDI files to tabla or mridangam samples. Scalloped fretboard guitar pioneer Matthew Montfort has devoted his life to cross-cultural music through his role as the leader of the world music group Ancient Future. He spent years of study with some of the world's best musicians, such as gamelan director K.R.T. Wasitodipuro, North Indian sarod master Ali Akbar Khan, and vina master K.S. Subramanian, with whom he did an intensive study of South Indian note-bending techniques. He has recorded with legendary world music figures ranging from Bolivian panpipe master Gonzalo Vargas to tabla maestros Swapan Chaudhuri and Zakir Hussain, and performed concerts worldwide, from the Festival Internacional de la Guitarra on the golden coast of Spain to the Festival of India in Mumbai. He has taught masterclasses at prestigious universities, schools, camps, museums, and resorts, and has over four decades of teaching experience, including two on the faculty of Blue Bear School of Music in San Francisco. 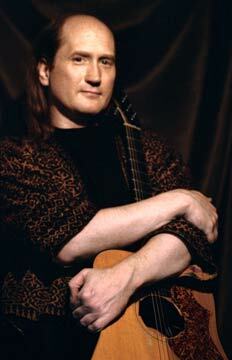 He is recognized as one of the world's 100 Greatest Acoustic Guitarists by DigitalDreamDoor.com, a curated "best of" site, along with such luminaries as Michael Hedges, Leo Kottke, Merle Travis, John Renbourn, Tommy Emmanuel, and Alex De Grassi. He was interviewed in the December 2009 Les Paul issue of Guitar Player Magazine about the scalloped fretboard guitar and the application of the rules of Indian raga to the music of Jimi Hendrix as exemplified by "Purple Raga" from his debut solo recording, Seven Serenades for Scalloped Fretboard Guitar. Matthew Montfort offers instruction based on Ancient Traditions – Future Possibilities through online lessons via Skype and rhythm workshops at conservatories, public schools, and resorts. Ancient Traditions – Future Possibilities has been used and admired by many teachers and musicians around the world. Lou Harrison (1917-2003), prominent composer and founder of the American gamelan movement, called the work "a very useful contribution to musical scholarship." Reinhard Flatischler, founder of the TaKeTiNa rhythm training process, was an early enthusiast of the method book. John Bergamo (1940-2013), composer and coordinator of the percussion department at the California Institute of the Arts, found a copy of Ancient Traditions – Future Possibilities when he cleaned out his desk at retirement. As he finally had the time available, he worked his way through it, after which he called the author to thank him for writing it, and encouraged him to write more world music training manuals. One is in the works. Steve Smith, stellar jazz and rock drummer of Journey fame, went through the book in preparation for a percussion summit with tabla master Zakir Hussain. Start your own journey to musical excellence with Ancient Traditions – Future Possibilities! All compositions, recordings, video, and text in this article © 2017 Ancient Future Music. All rights reserved.